Once you have your Silver Wolf, you will work towards your Gold Wolf badge. Along the way to the Gold Wolf you will earn four challenge awards: the Awareness Challenge (Caracal), Community Challenge (Cheetah), Outdoor Challenge (Leopard), and Aptitude Challenge (Lion), and you will earn a badge for each of these. Completing the Gold Wolf should take about 1½ to 2 years. To encourage the Cubs to lead healthy and active lives. To create an awareness of the impact humans have on the environment. Show a sportsmanlike attitude in all Pack games and activities and know why this is important. Explain the dangers of sunburn and heat exhaustion and how to prevent them. Be able to hop around a figure of eight, each loop with a diameter of about 4 metres, changing feet at the start of the second loop. Climb a rope to a height of three metres. Do TWO of the following: headstand, handstand, cartwheel, star jumps, leap-frog over a Cub your own size. Run Scout’s pace over a #km course in eight minutes. Swim 25 metres and then tread water for 60 seconds if in fresh water or #0 seconds if in sea water. Understand the importance of always drinking clean drinking water. Demonstrate how to make water safe for drinking, if no clean water is available. Find out about two infectious diseases and discuss how to prevent them from spreading with your Pack Scouter/Pack. Understand what effect smoking, alcohol and drug abuse may have on your body. Learn to play a board game. Play sense training games using all five senses and achieve a 70% score. Write and decipher a complex code. Build a simple bird-feeder and observe the birds that visit it for at least two weeks OR hold the Birds badge. Describe the uses of trees. Take care of a tree for one month. Find about two endangered species in South Africa and tell the Pack about them. Make and use compost from unwanted vegetation. Make or lay out a vegetable bed or herb garden OR prepare a seed bed/container and plant flower seeds. Identify everyday activities in your home which waste or consume energy. Heat water using solar energy OR use solar energy to cook something. Make your own diorama to show different types of habitats or environments, e.g. forests, grasslands, deserts or oceans. Acid rain is a worldwide problem affecting our planet. Find out about acid rain and demonstrate how it affects our planet. Find out how plants help fight air pollution and run an experiment to show this. To create a positive feeling of family and community responsibility. Do simple repairs at home or at your Pack meeting place OR hold the Repairs badge. Take care of a new Cub on their first activity. Make a gift and donate it to a worthy cause. Find out about an organisation that helps those in need in your community and do something to support it. Pick a new task to help out with at home/pack meeting place/school every month for three months. Lead a campfire song with others at a campfire. Make and play a simple musical instrument. Write a song or poem and sing it or read it to the Pack. Do two out of three. Take part in a Group, District or Regional activity. Make contact with Cubs from another Region or Country. List different cultural groups, other than your own, living in your community. Choose one and share something interesting about your chosen culture with your Six/Pack. To develop confidence and self-reliance by developing skills in the outdoors. Learn about fire and gas/paraffin safety and the correct way to light a fire in the open bush. Explain what to do in the case of a fire emergency. Lay and light a fire outdoors. Use a conservation stove and cook a simple meal for yourself. Camp out for two nights with Cubs either under canvas or permanent accommodation (does not have to be two nights in a row). Help pitch a tent and know how to take care of it OR build a simple shelter. Spend at least one night in the tent/shelter you have helped pitch or build. Explain what to do if you get lost in the veld. Discuss the natural dangers you may find in the veld. Go on a day hike with your Pack and know what to wear and take with you. Show how to use and care for a compass. Use a compass and one other method to find North in an outdoor environment. Using a compass follow a compass trail of six to ten moves. Show how to use a street map. On a street map explain and recognise six to ten map symbols. Lay a woodcraft trail where 20 signs are used for others to follow. Know how to hank a long rope. Help another Cub with a knot they may have difficulty with. Know the parts of the flag. Prepare, hoist, break and lower the flag correctly. Using a sheet bend join the flag to the halyard. Make a jungle character mask and use it in a jungle play/dance. To develop confidence in general life skills. Tell others about water safety by making up an activity or game. Show you can use at least one rescue method to help someone who has fallen into water. Tell others about home safety by making up an activity or game. Make a home fire safety plan for your family. Find out how to treat the effect of poisons that can be found at home. Identify at least ten traffic signs correctly. Demonstrate safety on the road as a cyclist OR safety as a passenger in a vehicle. Discuss the importance of never giving out personal information to someone you have never met. Discuss the implications of posting/texting negative content. Know how to behave in an emergency situation. Know and explain how to activate the Emergency Medical Services in your neighbourhood. Show how to treat burns, scalds, insect bites and stings and how to remove a splinter. Show how to stop bleeding by using direct pressure. Know how the 24 hour clock works. Using this system, give correctly the times of the main events of your day OR show an adult that you know what time to carry out important actions during the day. To reinforce their commitment to help others and to do their best at all times. Help organise and take part in a Cub's Own Service OR say a prayer of your own. Show that you are keeping your Promise & Law and setting a good example to younger Cubs in the Pack. Earn at least one interest badge per challenge - four interest badges in total. 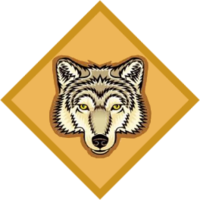 Requirements for the interest badges can be found under Cub Interest Badges. This page was last modified on 18 April 2019, at 10:33.